At Christmas Décor by Aqua Pool, we specialize in helping you capture the spirit of the holidays through the fine art of decorating your property. As a full-service design and installation team that can transform and enhance your home into the festive envy of the neighborhood, Christmas Décor provides all of the necessary supplies, decorations, and manpower so you can sit back and relax while we decorate your house with holiday cheer and dazzling lights. With careful attention to detail and holiday lighting, we love the gingerbread house effect that happens when we line windowsills and your property’s roofline with small dazzling lights that make your house appear like a jolly gingerbread treat! Trimming your front door and house eaves with fresh greenery like wreathes and garlands harkens back to more traditional Christmas decorations. The clean pine scent is also a key element in helping you get in the mood for a great holiday season. A classic and always a favorite! Classic or contemporary, at Christmas Décor we consult with you about your wants and needs and provide options when it comes to showcasing your magnificent home for the holiday. If there’s a specific theme, like Santa’s workshop, that you are interested in, talk to one of our professionals today about what we can do. 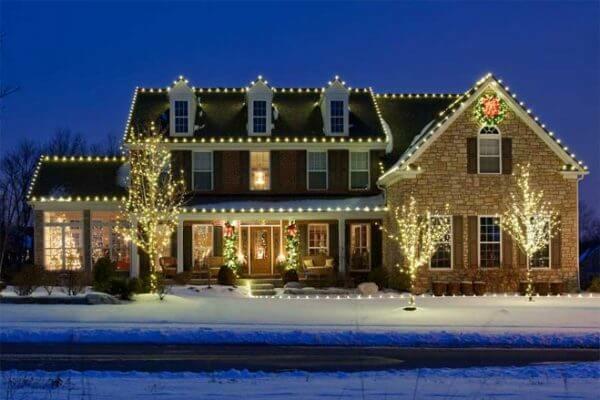 The typical Christmas holiday colors are red and green but with new LED bulbs, there’s a wide range of hot colors that can be used to spruce up the exterior of your home. From bright to traditional, red and green can be combined with flashy lightshows and other decorating elements to jazz up the usual holiday light ideas. Hurry to book with us, as Christmas will be here before you know it and our schedule is filling up!